Part of the €800 million cocaine seizure found by Cape Verdean authorities following a tip-off by European authorities was destined for the Irish market, according to former assistant commissioner with An Garda Síochána, Michael O'Sullivan. A record haul of 9.5 tonnes of cocaine was discovered hidden in 260 packet on a Russian-crewed, Panamanian-registered ESER vessel on Friday 1 February by local law enforcement forces in the small African island nation. Officials in Cape Verde had received information from the EU-funded Maritime Analysis and Operations Centre - an organisation that consists of law enforcement, maritime and naval personnel from seven European countries. Police said 11 Russians people have been arrested in connection with the seizure. Speaking on RTÉ's News at One, MAOC executive director Mr O'Sullivan said it was the biggest maritime drug seizure in European history. He said the body’s role was to "try and intercept the trans-national organised crime drug shipments from South America, particularly Colombia and that catchment area, coming to Europe". Describing how the organisation works, he said it "looks at various suspicious vessels, for want of a better term ... which we do have our best to have intercepted". "We're going upstream. We are tackling almost at the source. When it leaves the source country we try and get it intercepted before it lands in the streets of Paris or Dublin," he said. Mr O'Sullivan said this approach was easier than trying to intercept drugs once they reach Europe. "Once it gets to land it becomes a different ball game. Logistically, it becomes a lot easier to try ship the drugs around by road," he said. Mr O'Sullivan said this approach was most effective against organised crime groups. "If we get it at source we get it at its most pure level. It's at it greatest cost and its greatest loss to the crime groups," he said. As well as suggesting a portion of the 9.5 tonnes of cocaine found were destined for the Irish market, Mr O'Sullivan said it was likely crime gangs were involved in organising the shipment. "The amount of money involved, it's a consortium of trans-national groups," he said. "Given past practices, Irish groups would have been involved. "No single group could financially have afforded to purchase that amount." 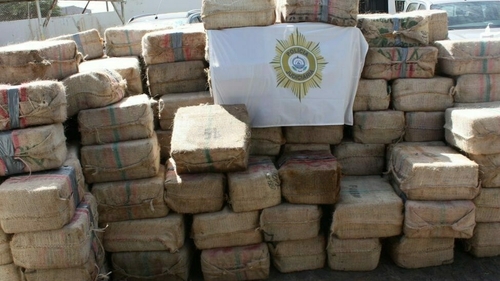 Despite the success at the weekend, Mr O'Sullivan said intercepting such shipments remains a battle of wits between law enforcement agencies, such as the Lisbon-based MAOC, and the crime gangs. He said: "You would wonder how much is getting through, but we can certainly say a lot more would get through to Europe if it wasn't for the good work of agencies throughout Europe who are pooling their resources."